Welcome to a special Crazy Crafters' Blog - we're all so excited about the new 2017-2018 Annual Catalogue going live tomorrow (yes- that means you can start ordering all the gorgeous new products we'll be showing you from tomorrow!) that we've decided to squeeze in an extra blog hop this month! If you don't already have a wish list, I'm sure you will by the time you complete your tour of this blog hop! I've been having fun using just the words from these thinlits but today I decided to use it as intended! I made a lever card with Berry Burst cardstock. I added a frame of Fresh Florals Designer Series Paper in Berry Burst and layered the centre with Whisper White card and the Lovely Words panel. In the closed position the flower in the corner blends into the Fresh Florals frame! 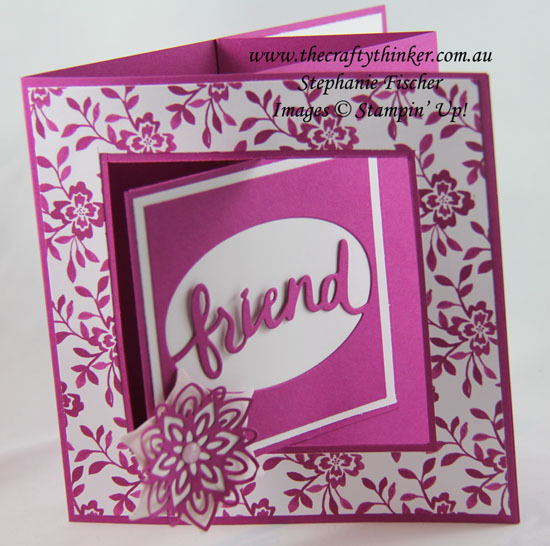 The flower in the corner is made from Whisper White and Berry Burst cardstock and the centre is a Glitter Enamel Dot. To make the flower, I used one of the Eastern Medallion thinlits to cut the White base and one of the Flourish thinlits to cut the detailed Berry Burst layer. I gently used a bone folder to slightly curl the top petals. 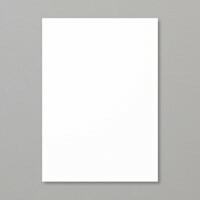 Monotone cards are anything but monotonous! 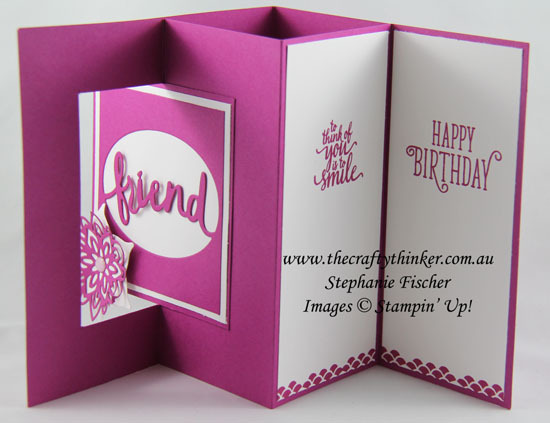 The sentiments inside the card are from Happy Birthday Gorgeous (to the right) and the Eastern Beauty stamp set (to the left). 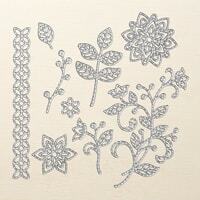 The lower edges of the Whisper White panels are decorated with a stamp from the Eastern Beauty set. 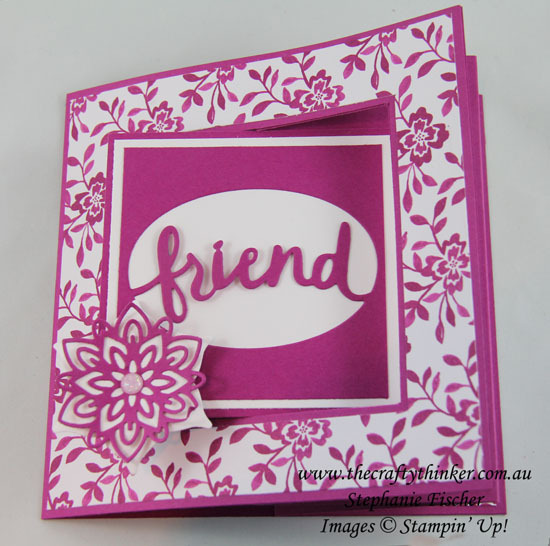 For all the stamping I used Berry Burst ink. 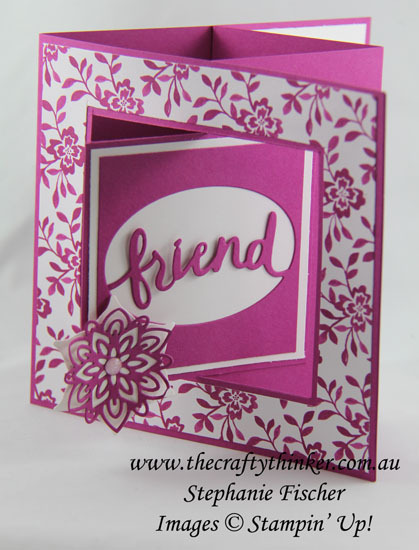 A cheerful, elegant and pretty card to give any friend a lift! Thanks for following our blog hop. Remember that currently you are at my blog - Stephanie Fischer - so click on the next name in the list to ensure that you don't miss out of seeing any of the blogs and the amazing inspiration they contain.